Diabetes:M is one of the best ways to keep track of and manage your condition. A logbook for glucose, insulin, nutrition, medications, injection sites, notes, categories and others. Vast food database with easy portion and quantity selection. You can easily add your own food to the database. Carbohydrates counting and insulin dose calculator. Extended bolus calculator mode for diabetics on both multiple daily injection and insulin pump therapy. Detailed timeline graph of blood sugar tests including also boluses, basal insulin, activity chart and other useful data. Summarize all your collected data in a visual way using easy to read charts and diagrams. Generate and share reports, log entries and charts to diabetes specialists for review. With Diabetes:M you can export the collected data and import external data from many other diabetes management systems. A powerful and reminders system so you never miss another check. Utilize the power of artificial intelligence to help you with your diabetes. Take care of your family. Monitor or manage data for up to 3 people with a single subscription! Advanced glucose analysis of logbook data with explanations for the most probable problem causes. Multiple devices automatic sync on data change. Connects to some of the most popular Bluetooth glucose meters. Diabetes:M is an award-winning diabetes logbook app that was first published in Google Play in April 2013. It was developed by diabetics to meet the needs of people who want to manage all aspects of their condition. Users can track, analyze, review and export data in great detail. Today Diabetes:M is an established tool with nearly 350 000 installations and over 50 000 active users. The application is well known to medical professionals, with many diabetes specialists recommending it to their patients. 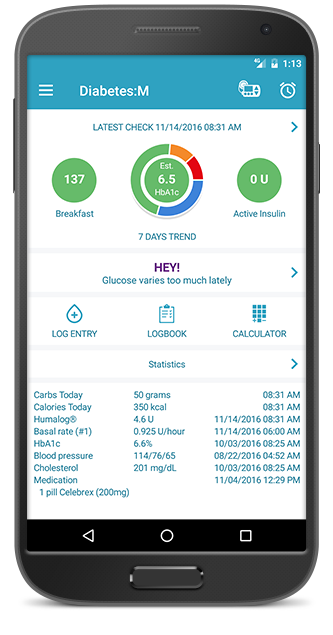 Designed for smartphones and tablets this application is intended to help diabetics to manage better their diabetes and keep it under control. Users can log their values in the logbook and keep the records with them all the time. The application tracks almost all aspects of the diabetes treatment and provides detailed reports, charts, and statistics to share via email with the supervising specialists. It provides various tools to the diabetics, so they can find the trends in blood glucose levels and allows them to calculate normal and prolonged insulin boluses using its highly effective, top-notch bolus calculator. Diabetes:M is one of the first diabetes management apps which started to support Wear OS smart watches when they were first introduced on the market. The best diabetes app! This app has most likely saved my life. Is over of those apps that provide you with everything you need well done. Best of them all I was diagnosed LADA a year ago. Downloaded a bunch of apps and used them all for a month. This one’s easily the winner. Extremely comprehensive, a complete set of features and enough customization to track carb intake; initial no pill and no insulin treatment; then medication only treatment; then long lasting insulin treatment. And I know it’s future proof for when I start the short term insulin and then the pump. Thank you! Life Saver! My blood sugar was at 589 and the doctors were suggesting that I needed to be hospitalized. The news that the doctor gave me scared me I was on the verge of having some major medical problems. I downloaded the application and started to use it religiously. This application has literally saved my life. The application is amazing. A Great Diabetic Log Program. I have been using this program for several months now and cannot go without it. I can accurately keep my glucose and dietary levels. I can also keep track of my blood pressure readings, weight levels, A1C levels and much more. I can prepare and print many different reports for my doctors. If you are a diabetic, you should use this program.